What is the Case For a Conspiracy in the JFK Assassination? You are here: Home › Further Reading › JFK Assassination FAQs › What is the Case For a Conspiracy in the JFK Assassination? Everyone knows that the JFK assassination is a controversial subject. Some people argue that President Kennedy was killed as the result of a conspiracy; others argue that it was the act of a lone nut named Lee Harvey Oswald. Advocates on each side of the debate rarely deal with the essential points made by their opponents. This article is an attempt to put forward the case in favour of a conspiracy, balanced by the arguments of those who oppose this interpretation. A complementary article puts forward the case against a conspiracy, together with the relevant opposing arguments. Anyone who has not yet made up their mind about the JFK assassination should read both articles. Anyone who has already made up their mind should certainly read both articles. Oswald had no credible motive. More than three shots were fired. Shots were fired from more than one location. The sixth–floor rifle was inaccurate and unreliable. Oswald was not a good enough marksman. Oswald was not on the sixth floor during the assassination. Oswald did not fire a rifle on the day of the assassination. Some of the evidence against Oswald was manufactured after the event. Oswald was set up in advance. The crime was not properly investigated. A large part of the Warren Report was devoted not to the facts of the JFK assassination but to the question of why Oswald killed President Kennedy. The Commission was unable to find a credible motive. There is no evidence that Oswald disliked Kennedy; on the contrary, several witnesses recalled Oswald expressing complimentary remarks about JFK both as a person and as a politician. Oswald never boasted about shooting JFK; in fact, he consistently denied having done so. Just because the Warren Commission was unable to find a motive, it does not mean that Oswald did not have a motive. If he committed the crime, he must have had a motive, however obscure that motive was. If Oswald were the lone assassin, he cannot have fired more than three shots. There is only one way in which all the wounds to Kennedy, Connally and Tague could have been caused by three shots: one shot hit Tague; one shot hit JFK in the head; and one shot caused all of JFK’s and Connally’s non–fatal wounds. That is the single–bullet theory, which has been repeatedly disproven by the medical, photographic and eye–witness evidence. If there were more than three shots, there must have been more than one gunman. The majority of the witnesses claimed to have heard three and only three shots. The Warren Commission and the House Select Committee on Assassinations, both of which were made up of eminent citizens, found that the single–bullet theory was true. Later research shows that the flapping of Governor Connally’s lapel may have been caused by the same bullet that had hit Kennedy, in which case the single–bullet theory is no longer impossible. A doctor who treated President Kennedy stated that one shot hit JFK in the throat from in front. Around 40 witnesses claimed to have detected at least one shot from the grassy knoll, which was in front of the motorcade. Acoustic evidence led the HSCA in the late 1970s to admit the possibility of a shot from the grassy knoll. Three home movies of the assassination, most famously the Zapruder film, show that Kennedy’s head went sharply backwards, not forwards, as a result of the fatal shot. Some of the grassy knoll witnesses were vague; others could well have been mistaken. There is no documentary evidence of a gunman on the grassy knoll; some conspiracy theorists claim that Mary Moorman’s famous Polaroid photograph shows a gunman peeking over the fence, but that is just wishful thinking. The acoustic evidence is a technical subject, and even the experts disagree on whether it demonstrates a shot from the grassy knoll. The doctor who claimed that JFK was hit in the throat later retracted that claim before the Warren Commission. The FBI and US Army examined the sixth–floor rifle and discovered that in its original state it was too inaccurate to have hit the target twice out of three attempts within six seconds. Even after the rifle had been repaired, the experts were unable to replicate Oswald’s alleged feat. Tests carried out on other rifles of the same type have shown that in some circumstances it was possible to fire three shots accurately in the time allowed. Oswald’s marksmanship was inferior to that of the Army and FBI experts who had been unable to do what he had supposedly done on 22 November 1963. Oswald’s final test score in the Marines, in May 1959, was only one point above the minimum qualifying level. There is no credible evidence that Oswald fired a rifle in the four and a half years between his leaving the Marines and the time of the assassintion. When Oswald was tested in the Marines in 1956, he reached the official ‘sharpshooter’ standard, the second of three levels of competence. His wife claimed that he had practised with the rifle that was used in the assassination. Several TSBD employees, including Carolyn Arnold, claimed that Oswald was on either the first or second floor when the Warren Commission required him to have been on the sixth floor. Several spectators in Dealey Plaza noticed a gunman in one of the upper windows at around the time of the assassination, but only one of them gave a description that fitted Oswald. That witness, Howard Brennan, was unreliable, and failed to identify Oswald when he came face to face with him later that day. The Warren Commission placed a good deal of faith in the testimony of Howard Brennan, and discounted the evidence of the other witnesses. Paraffin tests on Oswald’s hands and right cheek indicated that, in the words of an internal Warren Commission memo, “At best, the analysis shows that Oswald may have fired a pistol, although this is by no means certain. … There is no basis for concluding that he also fired a rifle” (memo from Redlich to Dulles, 2 July 1964, Investigation and Evidence File, RG 272, Series 12, box 4, folder 3, National Archives). Neutron activation analysis confirmed the absence of incriminating quantities of gunpowder residues on Oswald’s cheek, and demonstrated that the rifle he was accused of firing would certainly have deposited such residues. A positive result can be caused by all sorts of common substances, such as printing ink from the books that Oswald had handled on the morning of the assassination. A negative result can be due to the imprecision of the standard tests. Even though neutron activation analysis is more accurate than standard paraffin tests, the results in this case are not definitive. Because they were kept secret for many years on the grounds of national security, they have not yet been assessed by experts. Several pieces of physical evidence in the JFK assassination are not authentic. The home–made paper bag, supposedly discovered close to the sixth–floor sniper’s nest, was almost certainly manufactured by the Dallas police on the afternoon of the assassination. Commission Exhibit 399, the intact bullet that was supposedly discovered on Governor Connally’s stretcher in Parkland Hospital, was introduced into evidence fraudulently. Not all of the claims of forgery are correct: the idea that the Zapruder film was faked, and the notion that President Kennedy’s body was altered to fool the pathologists at the autopsy, are ridiculous. The HSCA concluded that the back yard photographs, which show Oswald holding a rifle, and which are often claimed to be forgeries, are in fact genuine ( HSCA Report , appendix vol.6, pp.138–214). It is not uncommon for over–enthusiastic investigators to manufacture evidence to bolster the case against suspects who are in fact guilty. Even if some of the evidence against Oswald was faked, it does not mean that Oswald is innocent. Plenty of the evidence in the case is genuine. An man calling himself Lee Oswald visited the Soviet and Cuban diplomatic compounds in Mexico City in late September and early October 1963. He enquired about obtaining a visa to visit Cuba, and spoke to a Soviet official whom the CIA suspected of being part of the KGB’s assassinations department. The man who called himself Oswald, however, was not Oswald. The impersonation of Lee Harvey Oswald in Mexico City is proof that there was a conspiracy: either Oswald had an accomplice, or he was set up. The fact that he or an impostor met the KGB agent implies either that the Soviet regime was involved in the assassination or that the Soviets, like Oswald, were being set up to take the blame. The fact of the impersonation is undeniable: it is acknowledged by several official sources, including J. Edgar Hoover and Lyndon Johnson. There is no credible explanation for the impersonation that does not involve a conspiracy. After the assassination, many people claimed to have seen Oswald doing all sorts of strange things. Incorrect sightings of victims and perpetrators have occurred after many well–known public tragedies. As in the Oswald case, some of the sightings were instances of mistaken identity, and others were clearly invented. Theorists have come up with plenty of implausible conspiratorial explanations for these apparent sightings of Oswald in different places at the same time, such as the outrageously unlikely ‘Harvey and Lee’ theory. This notion posits two Oswalds, one called Harvey and one called Lee, both of whom were co–opted into a top–secret undercover operation when they were boys, in the hope that when they grew up they would turn out to look sufficiently alike for one to be able to impersonate the other. This dastardly operation was apparently co–ordinated by the CIA, unless the CIA was itself being impersonated as part of a wider doppelgänger operation, possibly masterminded by a cabal of giant lizards. As a direct result of the impersonation of Oswald in Mexico City, the Warren Commission was established for the purpose of “having something issued so that we can convince the public that Oswald is the real assassin”, in J. Edgar Hoover’s words ( HSCA Report , appendix vol.3, p.472). The Commission itself did not actively investigate the crime; it merely considered evidence that was supplied by official agencies, mainly the FBI, which had its own institutional reasons to ignore evidence of conspiracy. There are numerous examples of the Commission manipulating the evidence to fit its preconceived conclusions: asking witnesses leading questions, ignoring unhelpful witnesses, disposing of inconvenient documents by classifying them secret, and reaching conclusions that were blatantly contradicted by the balance of the evidence. Even some of the Warren Commissioners themselves, notably Senator Richard Russell, did not agree with its conclusions. 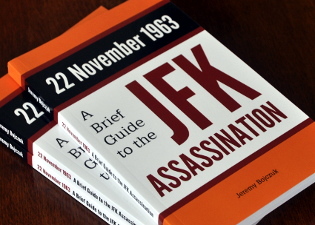 Only two chapters of the Warren Report actually dealt with the assassination; the rest was padded out by peripheral material, such as biographies of Lee Oswald and Jack Ruby. Although the Warren Commission’s conclusions were in place before it began its investigation, the majority of commentators in the media considered it to have made a convincing case that Oswald was guilty. Newspapers and television stations have consistently supported the Warren Commission’s verdict. What is the Case Against a Conspiracy?